Home Cars Toyota Motors Philippines launches 2015 Camry: A Bolder, Sportier, Premium Luxury Sedan! 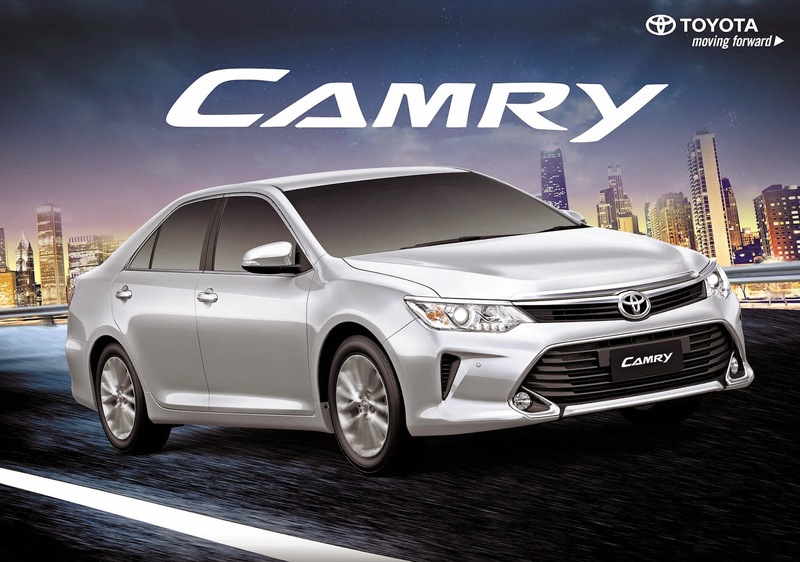 Toyota Motors Philippines launches 2015 Camry: A Bolder, Sportier, Premium Luxury Sedan! Toyota Motor Philippines (TMP) recently unveiled a bolder and sportier look of its premium luxury sedan. With a design that emanates the perfect balance between refinement and excitement, the bestselling sedan in its class reveals itself with a more modern and classier look. Its aerodynamic styling and valiant stance exudes a strong presence that complements the vehicle’s luxurious and iconic title. Named after the word “Crown”, the Camry definitely is a symbol of Prestige. The new Camry boasts an innovative front design that is both aerodynamic and sporty. Its front grille and headlamps now have the signature Toyota “under-priority and keen look” offering its customers a more appealing shape. Moreover, the new headlamp cluster design uses efficient light-emitting diode (LED) daytime running lights for the first time, giving the vehicle a distinctive bearing in all road conditions. The side design on the other hand has also been refreshed with new side rocker moldings and the bottom sections of the front and rear side panels. As for the new Camry’s modern exterior, the new LED tail lamp and stop lamp technology enhance the sporty look as seen in its rear area. It also displays a chrome trim located between the rear combination lamps plus a new rear bumper providing a firmer stance. Moreover, the edge of the trunk has a new spoilerlike shape that helps air flow smoothly up to the rear end of the vehicle. As you step inside the vehicle, one can immediately notice the quality upholstery and stitching throughout the cabin. Aside from the vehicle’s signature excellent comfort and convenience, the new generation sedan is paired with cutting-edge technology, promising refinement and utmost prestige. Now with a High Definition meter and multi-information display (MID), the new Camry offers a better view of more information inside the vehicle whether day or night. It also adopts a new clear blue interior illumination creating a luxurious atmosphere for night drives. Moreover, the 2015 Camry is available in two interior colors, flaxen / black (for 2.5 V and G only) or black (3.5 V6 only), either of each reflecting the unique style and image of the owner. The 7th generation Camry balances a sense of power and comfort that speaks of its authoritative driving performance and lavish interior. With the same reliable 2.5 Liter 4 cylinder, 16-valve Dual VVTi or 3.5 Liter, 6-Cylinder, 24-Valve Dual VVT-I V6 engine, Toyota’s premium sedan provides a maximum output of 204kW/6,200rpm, and maximum torque of 346Nm/4,700rpm. The chassis system is highlighted by the 6-speed sequential automatic transmission available in all variants. Moreover, a strong combination of recalibrated Electric Power Steering (EPS) and retuned suspension offering a solid steering feel and response with excellent handling performance and ride comfort. The 2015 Camry passes the highest standards for global quality with its active and passive safety features to cope with different driving situations. The New Camry features enhanced vehicle control systems such as Anti-Lock Braking System (ABS), Electronic Brake Force Distribution (EBD) and Brake Assist (BA.) These features reduce the risk of accidents in emergency situations. Moreover, additional safety functions have been included such as Hill-start Assist Control (HAC) and Vehicle Stability Control (VSC). Lastly, the premium sedan comes with the standard SRS airbags as well. Raising the level of excitement, Toyota now offers an additional variant in its flagship sedan that exudes a sportier and active appearance. The Camry S will definitely give drivers a more empowered feel with it exclusive Sequential paddle shifter. Moreover, it sports 5-spoke 17” alloy wheels and dual exhaust tail pipes with diffuser to complement the performance-driven nature of its customers. Designed for owner-driven patrons, this variant carries sporty leather seats with red stitching and a finely-crafted leather steering wheel design. It also has a sports brake pedal for better performance driving. The New Camry is offered in four variants; 3.5V6 AT at P2,128,000; 2.5V AT at P1,745,000; its new sport variant 2.5S AT at P1,645,000 and 2.5G AT at P1,511,000. The premium sedan comes in several shades: White Pearl (for an additional P15,000), Silver Metallic, Medium Silver Metallic, Gray Metallic, Gray Mica Metallic, Attitude Black, Beige Metallic and new colors Grayish Blue Mica Metallic (exclusive for 2.5S only) and Dark Brown Mica Metallic. Visit your nearest Toyota dealership to witness the transformation of the new premium luxury sedan.